How are you, how was 2017 now you look back? What was good and bad? Tell us about your EP on Apollo. Where was it written, and does that inspire it? The single was written in at Bulletproof Studios here in Chicago, on the north side. I worked with our guy KE via the internet, so it was a bit of a digital collaboration. Did you write it with the label in mind, does it fit their sound, do you work that way? Tell us about the The Outfit alias, how does it differ from your other work. 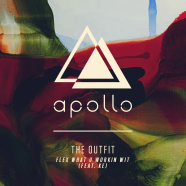 I’ve been using the moniker “The Outfit” since we launched the Apollo label a few years ago. The sound is straight up Chicago house; acid and tracky joints. The name is a play off the Chicago mob during prohibition and was originally going to be a moniker for an unknown collaborative group in Chicago (similar to the UR concept). At this point it’s only been a solo effort on my part, but that’s not to say that it couldn’t change in the future. I suppose the difference doesn’t vary too much from my previous aliases. I’m also currently releasing under System 5 on Apollo and that sound is a bit deeper, with a bit less of the grit and bite that The Outfit has. All in all, I’m sure the signature elements are all here from what I wrote as No Assembly Required with Justin Long. What gear do you use to produce, does that matter? Are you interested in the how? Honestly, I’m a believer in results. I’m always interested in the how, but I don’t think it matters what you use, as long as your music speaks for itself. I’m a keyboardist and a drummer at heart, so I’ve always had a lot of outboard gear over the years, which I always play live into a DAW where I do all my editing and sequencing. Right now I’m running a Nord Lead 2, Moog Little Phatty, Roland TB03 and a Roland Juno Di. My studio has changed so many times over the years as many pieces of outboard gear have come and gone, but overall I’ve been using the same general method for 20 years now. I think my current setup is my favorite rig. How much do your experiences as a DJ relate to what you produce – is there an on going feedback loop there do you think? In dance music, it’s 100% relative. One of the main outlets for this music is nightclubs where people dance, so if you aren’t keeping that in mind, you’re probably missing the point. I think the feedback loop is subject to your audience and peers, but again, it’s all relative to making people move. Do you have hopes and goals and dreams for the year, things you would like to achieve? Yea, just one and that’s to have fun. If there is one thing that I’ve learned over the years, it’s to not let the money, BS, or politics get in the way of the music that I love. I’ve done my time on tour, so at this point I’m focused on studio production and running our music companies. And any personal resolutions for the new year? Yea, not to have any more resolutions Ha! Seriously though, I’m a believer in living it out every day. I’m too old for big changes at the end of every year, lol. What would you like for Christmas in an ideal world? Sure, if I could get someone to come by and finish the basement in our house that would be great. Also I’m looking to get some landscaping done. This would all be for free, since you said Christmas gift. What have you got coming up in 2018, anything you can tell us about?